Now here’s a great name for a flower if I ever did hear one. Sweet Everlasting! What a perfect name! 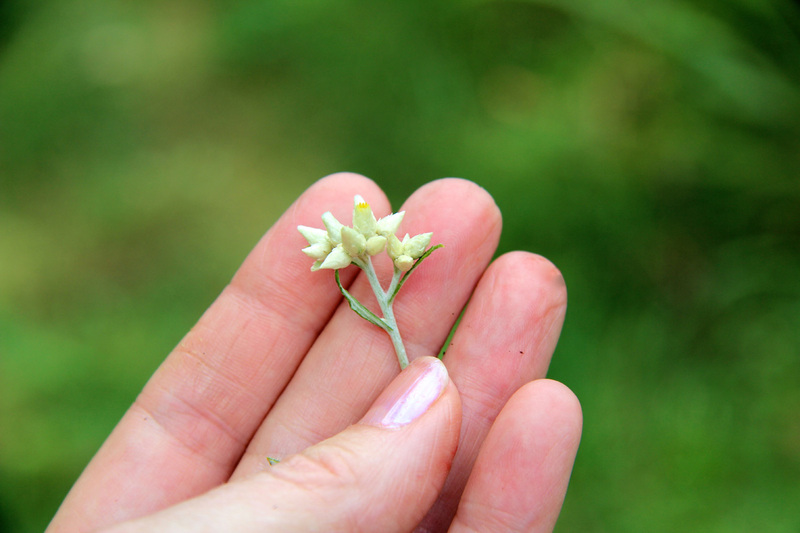 The flowers of Sweet Everlasting are a bit odd because they are dry to the touch, even when new. That’s because the tiny flowers are wrapped in layers of dry, white bracts. Deep inside these layers is a very inconspicuous disk of yellow to brown flowers (this is an aster believe it or not). You have to look hard to see the disk. Later in the season the bracts will spread out as the seeds ripen, creating an even prettier display of showy white buttons. Being already dried, these flowers make great (ever-lasting) additions to flower arrangements and can be used in other decorative ways. The flowers occur in small clusters and look like unopened buds at the top of the plant. The narrow (linear) leaves of the plant are soft and wooly, and somewhat grayish-white in appearance. Look closely and you’ll see that the needle-shaped leaves have wavy edges. The leaves can be 1 to 3 inches in length; the overall plant height is 6 to 30 inches. Sweet Everlasting is an annual or biennial. It first comes up as a basal rosette and later produces a tall stem that terminates in a branching flower stalk. The entire stalk can be gray-green to solid white due to a coating of tiny hairs. This is a plant that demands to be touched! This plant has many other common names, including Fuzzy Gussy and Sweet White Balsam. It was also known as Rabbit Tobacco, and it was smoked and chewed by Native Americans and early pioneers. Medicinal uses include sedative, diuretic, astringent, and cold-symptom and pain reliever. This plant sounds like a medicinal masterpiece, and to top it off it smells like maple syrup when crushed! Sweet! Look for Sweet Everlasting growing in dry fields. I found these out at Murphy’s Farm in Craig County in early September. A similar local species, Pearly Everlasting, has globe-shaped flowers that look like little pearls. Pussytoes is also related. I can’t figure out how to comment on your next post, Turtleheads, but just wanted to stop by and say hello, since that is how I found your blog. Saw a bunch of unknown purple flowers at the top of Apple Orchard Falls, and decided to figure out what they were, and Google lead me here. Definitely have this blog bookmark now, and I’m sure I’ll b a frequent visitor as I try to learn more about our local flora on our many outdoor adventures!! Thank you! Welcome to my wildflower hangout, April. You’ll quickly see that I am not an expert…just an enthusiast with a camera! Please feel free to drop me a line anytime, and feel free to correct my ID work. I’m learning too! Which of the two, pearly or sweet, has a fairly intense sweetish scent? My elderly father once expressed great fondness for this flowerand he let me smell it. That was over twenty years ago and we haven’t seen any since. I’ll bet he used to sneak out to the fields and chew or smoke it as a young boy growing up on a Kentucky dairy farm. I’d like to buy him some seeds and grow them for him for Father’s Day.